Ask anyone in a relationship “what’s the one thing you wish you could do more of?” and their answer will probably be “spend more quality time with my spouse/significant other” or “take a weekend away with my spouse/significant other”. Well, here’s the thing…couples need couple time. Whether you’re used to travelling with kids, friends, or siblings; or maybe you’re just too busy to travel at all, isn’t it about time that you and your significant other did something just the two of you? One weekend away can reinvigorate a relationship, we’ve seen it happen on many occasions here at the Mallard Mountain Lodge. But it’s not just us that have seen the magic happen, Psychology Today also says “Partners who do things together become more closely connected and come to enjoy each other’s company. That’s because shared experiences give them something in common and that helps make them feel good about each other.” We have a solution for you (plus the helicopter is included!). According to Psychology Today “the amount of time together matters but it’s more about how that time is used. For joint activities to be beneficial, they have to meet a few criteria. First, they have to lead partners to interact with each other in a positive way…Secondly, joint activities have to be enjoyable to both partners. Some couples have at least one or two similar interests”. If skiing is a shared interest sign up for our AT 101 Program. On this week-long introduction to alpine ski touring or backcountry snowboarding course, couples can confidently learn backcountry travel and avalanche safety together. Learning a new skill together gives you a shared experience, stories and memories that are uniquely yours outside of your usual social circles. Life is all about the special moments. Whether out for a dinner of fine dining, laying on the beach in the tropics, or standing on a mountain-top at sunrise, these are often the experiences that bring us closest together. When shared with that someone special, they are the type of memories that will last a lifetime. By far the most private use of Mallard Mountain Lodge is the Honeymoon or Anniversary trip. This is for those looking for something truly unique and special, where the most important thing is spending time with that special someone. Exclusive use of the lodge, along with a personal guide and chef, creates an unprecedented experience unlike anywhere else in the world. With only two guests on site, every detail of the trip can be customized. Menu plans, accommodations, as well as day to day activities can all be configured and modified to enhance every aspect of the trip. For those looking for a truly unique experience, Mallard Mountain Lodge offers a unique opportunity to create a truly once in a lifetime trip with that special someone. Feeling like a summer escape? We’re also BC’s most remote and private backcountry hiking lodge. Ever sat on a chairlift and wished that everyone else would disappear and you’d have the resort all to yourself? Well, here at Mallard Mountain Lodge dreams do come true. We have 18,885 acres on the western slopes of the Canadian Rocky Mountains near Jasper. In this power paradise, we mindfully built a small, intimate lodge so that couples and small groups can escape the crowds at an affordable price. 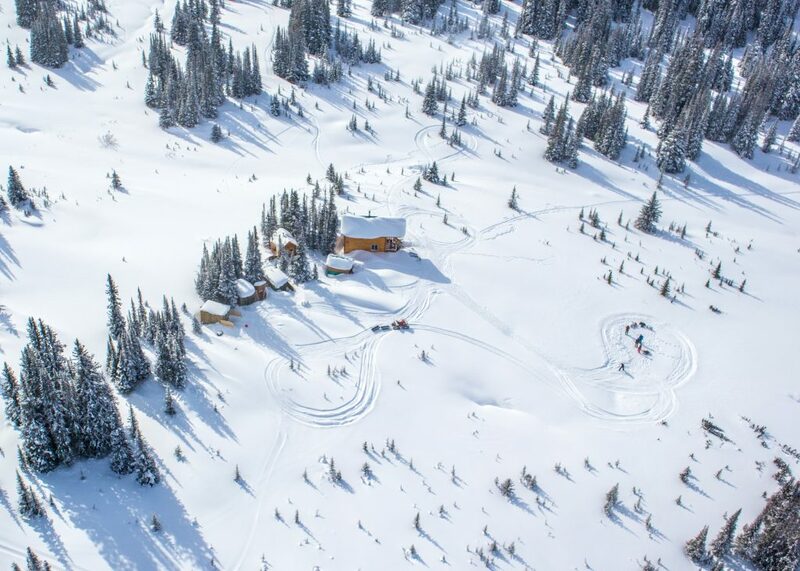 Guests arrive at the lodge via a 77km helicopter ride (around 30-minutes) that takes off from our helipad at Valemount, BC and fly south-east into the backcountry along the British Columbia and Alberta border. Touching down at the lodge is like being whisked away to your own private ski resort. If you reserve the lodge just for the two of you, that is how many people will be skiing the slopes. 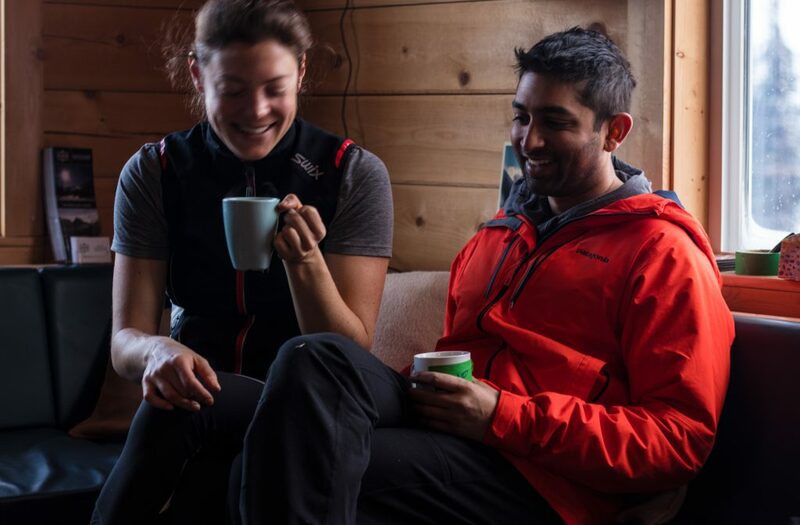 Does a week at a private backcountry ski lodge look like fun? The Mallard Mountain Lodge is your home away from home. You can make it what you wish, and every visit can be totally unique. Self-guided or fully-guided, fully-catered or cook romantic meals for yourselves there is getaway here for every couple. To inquire about booking our backcountry lodge for your ski touring or backcountry snowboarding trip, call (250) 835-4516 or fill out the form on our Rates & Dates page. We can’t wait to see you! The Mallard Mountain Lodge is our heli-accessed backcountry ski lodge deep in the western ranges of the Canadian Rockies. Once you arrive at the lodge there are no TV’s and no neighbours…but plenty of quiet, breathtaking alpine terrain to explore right from your doorstep. In both summer and winter, we accept just 8 guests at a time. Groups of 6+ automatically have private use of the lodge and parties smaller than 6 can easily reserve the whole lodge for private use. The 30-minute, 77km helicopter flight each way offers spectacular views of the Monashee Mountains, the Canadian Rocky Mountains and the historic Canoe River. It is the perfect way to round out your epic backcountry skiing, snowboarding or hiking trip.